I know I said we'd hit DPA mics next, but I left the sales sheet in my office this weekend. And in the quest for accuracy, I need that info. We'll take a detour and get back on track soon. So we're clear, some of these consoles are not new. This is just the first time I've gotten to get my hands on them for any significant amount of time. One is brand new, the others have been out for a while. Remember too, that these are initial impressions based on no more than 10-20 minutes of hands-on time, and really are evaluations of the work surfaces only. There was no real way to tell how the desks actually sound (in fact, only Soundcraft and A&H had any audio even coursing through them—go figure). We'll go in ascending order of price (give or take). Look familiar, O1V users?Phonic is not new to audio products. Many of you may already own a PAA2 or PAA3 portable analyzer. They also make a bunch of other stuff; signal processors, amplifiers and mixers. Most are targeted toward DJ applications. They are about to dive into the world of small-format digital mixers with the Summit. According to Larry Lai, Phonic Product Manager, “The Summit is feature heavy, and easy to use." Based on the few minutes I got to play with it, he's not far off. 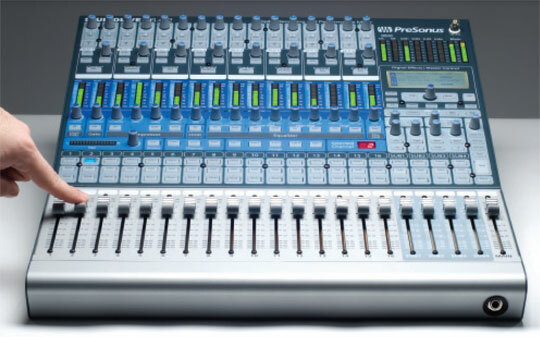 The Summit has 16 input channels, 8 Auxes and 8 Groups plus L&R. It features built-in dynamics on every channel (your choice of comp, gate, limiter or expander) and 2 effects processors. USB and FireWire connectivity is also included, though I'm not sure how much. It features a color-touch screen and a pretty decent menu architecture. I looked at it because I'm keeping my eye open for a small format digital mixer for a portable system. After trucking two racks of gear up to Winter Camp this year, I'd love to have something with the power of an O1V in a small rack with speaker processing and wireless. 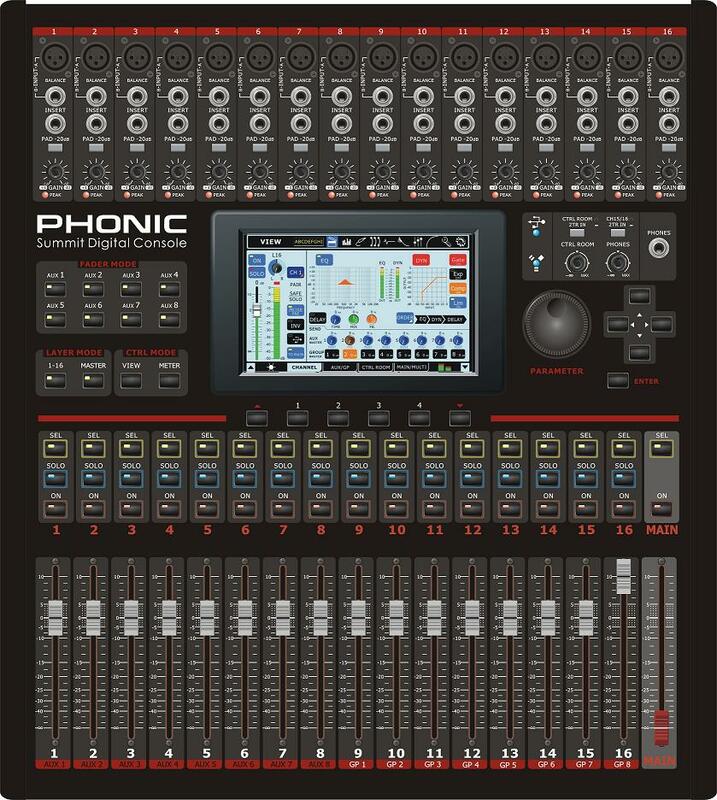 The Phonic looks a lot like the O1V, and has many of the same conventions; buttons that switch the faders from inputs to aux sends, for example. Without knowing how it sounds, I can't recommend it yet. What I can say is that it is feature-rich. On the other hand, the software is still a bit slow. Controls inputs were followed by a second of delay before the screen actually changed. Overall, it seemed pretty intuitive, and I was able to get around it pretty quickly. The jury is still out, but it may be a solid option. Learn more at Phonic's website. StudioLive 16:4:2. Not sure whose finger that is.I've been seeing this in trade rags for months now and have been intrigued. Again, thinking of my desire for a decent small-format mixer, this seems like it's got the goods. It features 16 inputs, 6 auxes, 4 subgroups and L&R (there is also a new 24:6:4:2 version). They also include 22 comps (inputs + auxes), limiters, high pass filters; 2 effects engines; 2 graphic EQs; and 2 master stereo limiters. So far, so good. They also add a 22x18 FireWire interface. It has save/recall and copy/paste functions. And 4 band EQ on each channel. When I walked up to the desk, it took a few minutes to get my bearings. They use the 16 rotary encoders over the channel inputs for the comp, gate, and EQ. It takes some time to get used to the layout. I think once I spent some time on it, it would be quick to get around. What I didn't like was the lack of visual feedback for settings of EQ, comp, gate, etc. Like the O1V, you can control the StudioLive from a Mac or PC using the freely downloadable software. With the software, you get a lot more visual confirmation of what you're doing. Like all small desks, they have limited real-estate to pack in a lot of features. My initial reaction was, "I don't like it." However, it does pack a lot of punch for the price. And while my reference desk in this space (the O1v) also has a tricky to master interface, I eventually came to like it. So it ma be worth a shot. Check it out at Presonus.com. This is getting long, so next time, I'll recap the Soundcraft Vi4 and the A&H iLive T-series.